Archaeologists from the University of Oregon have a brand new checklist for their fieldtrips. 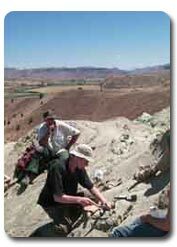 Many kinds of fossils can be found on the BLM-managed public lands in Oregon and Washington, some world-class in scientific importance. Fossils are the remains and traces of once-living organisms, preserved in rocks of the Earth's crust. BLM managed lands in Oregon have fossil resources ranging from near-shore Oligocene marine species along the margins of the Willamette Valley to the well-preserved, remarkably complete fossil record of plants and animals within the heavily eroded volcanic deposits of the scenic John Day River basin. A new fossil find represents the earliest record of living beavers (Castor) in North America. A pair of teeth was found on Bureau of Land Management land near Dayville, Oregon. These teeth come from the Rattlesnake Formation and are between 7 and 7.3 million years old. The specimens will be going on display in the Thomas Condon Paleontology Center, at John Day Fossil Beds National Monument. The new find is described in an article appearing in the current issue of the Journal of Paleontology.